Offline like today there's something incommutably fey about grand old football grounds and their environs, minus the seaside-resort pathos. 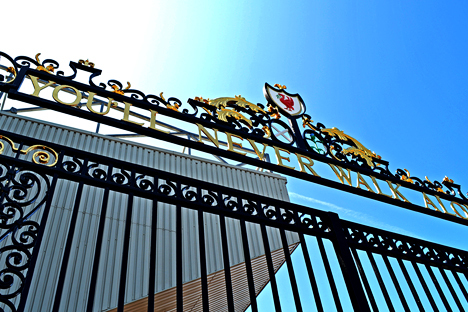 Anfield is 'an all-year-round place of pilgrimage... a kind of sacred spot regardless of whether a match is in progress' according to the English Heritage book Ordinary Landscapes Special Places. Down the years its 'regular bouts of [matchday] commotion gave a distinctive flavour to the tranquility which descended once the roar from the stadium had subsided and the supporters had dispersed'. At waist-height next to the central deadlock is a small brass panel and when I wet the tips of my fingers and smear away three decades of dust and grime an engraving appears: SHANKLY GATES DESIGNED & MANUFACTURED BY COUNTY FORGE 1982 followed by the prosaic flourish of an old telephone number with an obsolete area code. When I call his mobile Ken needs reminding about this proud little nod to posterity but easily recalls the moment he received the original commission from Liverpool FC and the ten frantic summer weeks he had to build the gates between the end of one football season and start of another. "I was 25 at the time and I'd been a Liverpool fan for years, since the Keegan and Toshack era of the early 70s. It was my father who saw the advert in the paper for a Shankly memorial. We rang up and eventually got through to [Liverpool club secretary] Peter Robinson who gave us the number of the architects [Mather & Nutter who became Atherden Fuller and incidentally constructed a new stand at Manchester United's Old Trafford in 1995]. They gave us the brief and our design was one of ten which were submitted. The story goes that they were all laid out on a table in front of the selection committee which included Mrs Shankly, who chose ours. There was nothing to touch it, she said. I remember when we got the phone call my dad said I went as white as a sheet - we were in shock." Ken kept all the press cuttings that ensued including one from the Somerset Standard that Diana from the museum in Frome has since kindly scanned and forwarded to me. 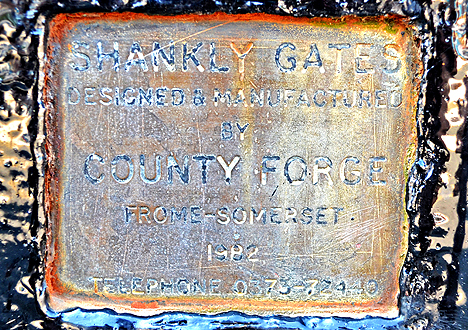 Dated 13 August 1982 it reports how County Forge had 'gained the contract in the face of tough opposition from all over the country' and approached a master blacksmith, Chris Brooks (then 40) from Melksham in neighbouring Wiltshire, to assist with the most technical and elaborate elements of the job. The paper remarked upon the 'astounding' detail of the ironwork whose most ornate part, the overthrow, sits atop and apart from the 14ft x 16ft gates and gleams in this morning's sunshine. Above the legend YOU'LL NEVER WALK ALONE and embellished with swirling gold acanthus leaves is to all intents and purposes the Shankly heraldic device: the white cross of St Andrew and a green-stalked thistle with a bluish-purple flowerhead, together denoting Bill's Scottish roots, and a crest bearing a blood-red Liver Bird to symbolise his sustained passion. Clearly the gates get a regular and loving lick of paint, and so they should. "Eez theez the men entronz?" Sergio, in his khaki cargo shorts and red polo shirt with Roland Garros Paris embroidered badge, enunciates in infinitely better English than my Latin American Spanish. On holiday in the UK with his wife and daughter, he's a doctor from a town in Uruguay called Canelones, which I learn is named after a species of cinnamon that grows along the banks of a local river. And en route from Edinburgh to London he's stopped off at Liverpool Football Club because he's a fan of Liverpool Futbol Club, which plays in black-and-blue stripes and was named not after Shankly's team but the port of Liverpool itself which shipped coal to Montevideo in the first half of the last century. Behind Sergio a minibus pulls up and discharges a school football team in full kit. They're drawn towards the adjacent Hillsborough memorial with their grown-up coach in tow, staring at the 96 names, and one beetle-browed lad with a northeast accent asks ingenuously "How did they all get squished?" The coach's explanation is so scrupulous and deferential I want to walk over and shake his hand. As a third-generation Kopite the least I can do is offer a rough guide to Sergio when he asks a similar question. Outside Anfield this kind of tableau can occur on any given Sunday, in the shadow of the stadium athwart the grand late Victorian merchant homes and terraced workers houses built with Welsh brick and slate before the football club existed. It's almost routine. "Originally the club were only thinking about a set of gates but we came up with the idea of the overthrow and they liked it," says Ken. "We both had apprentices so there were four of us working on it in the end. Chris did the leafwork on the overthrow and I forged the gates, which we had to make one at a time, laid flat on top of each other like a big table because my workshop was quite small." The overthrow was coated with primer, he continues, but not painted until the entire three-and-a-half-ton structure was loaded by crane onto a lorry and transported the 200 miles north to Anfield before the start of the 1982/83 season. 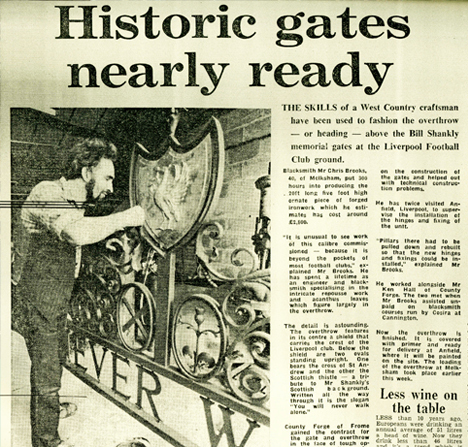 Less than 12 months after Shankly's death aged 67, in the period when Liverpool FC's fortunes consistently defied the city's socio-economic fall from grace, Bill's widow Nessie formally unlocked the gates accompanied by their grandchildren, the club's chairman John Smith, manager Bob Paisley and team captain Graeme Souness. 'It is not thought a similar honour exists in football', proclaimed a subsequent matchday programme. 'A comparison would be the Grace Gates at Lord's in honour of WG Grace'. "Enthusiasm got us through it," admits Ken, now 56 and still living and working in Frome. "We were shattered at the end but always confident about completing the gates on time. The only worry was about getting them to fit. We were nervous but the installation was perfect - just 3mm out on one of the hinges. I've only been back to Anfield twice since. The last time, we were in a taxi heading for the ground and when we told the driver he wouldn't charge us for the fare. 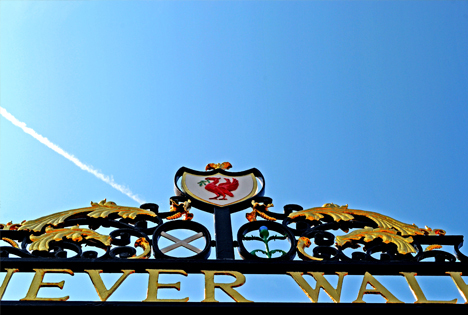 I've still got an enamel brooch of a Liver Bird that was given to me by another chap who came down [to the forge] when we were still making the gates, just to be photographed next to them. He told me his grandfather had given it to him. I'd love to return it to him some day."